If you hadn’t caught our Imperial Knights: Renegade Unboxing you may have missed out on what this box offers you. It comes with two Imperial Knights which can be built to a handful of variants but also comes with some Sector Mechanicus scenery. We were impressed by the sheer amount of content in the box. However, did you know it comes with a bespoke game system to use these models alongside as well?! Whilst I know most of you guys are buying the box to use the models in Warhammer 40,000, it’s worth looking into the Renegade game itself. As covered previously, the sheer amount you get within this box is astonishing. To see all these sprues and components laid out flat is nothing short of eye-opening. Hell, the sheer weight of the box is all the indicator you need that this product does not skimp. Within the box you get all the sprues you need to build two Knights of five variants. The only slight gripe is that the upgrade sprue which gives you the carapace weapon isn’t duplicated, so you only get one Icarus Cannon, for example. This isn’t a deal-breaker, not even close, just a mild nuisance. I’ve already said it in my unboxing, but I’m going to say it again. This box is value manifested in cardboard/plastic form. Whilst this box is available the option for buying a single Knight is drastically less appealing. 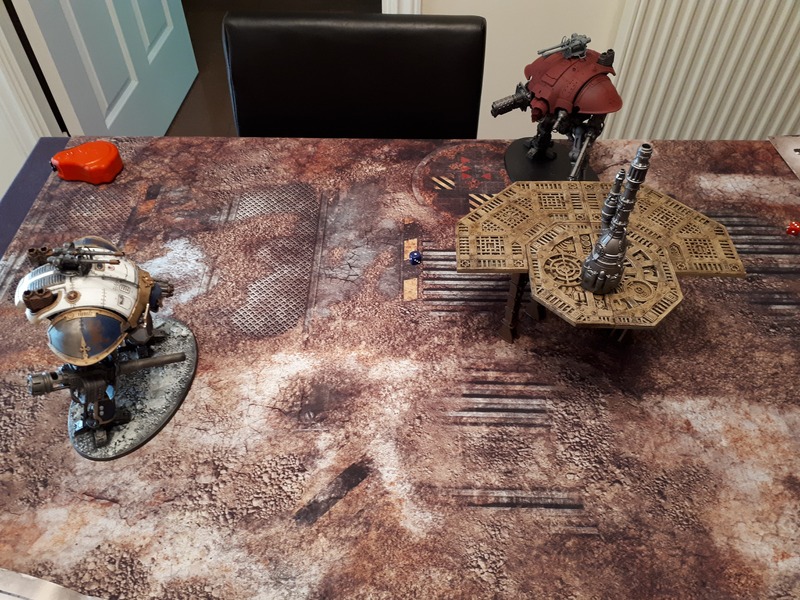 To buy an Imperial Knight for £95 seems preposterous when you can get two along with some scenery for £25 more. Unless you only absolutely need a single Knight, go for Renegade every single time. It’s almost a case of buying one Knight, get another one free! Whilst the game area feels a little bit bear, it’s likely worth noting that most buildings and structures in the way would get stamped into dust under their titanic feet. I missed the Renegade release last time round so this is all entirely new to me, if it is even the same game at all. Within the box alongside the models comes the actual game itself which pitches two Knights against each other. One is loyal to the Imperium and the other is a Renegade Knight (gasp). The rule booklet comes with about 6 missions to be played using the bespoke game system. The core of the game is that the two Knights can attempt to shoot at or fight each other in an attempt to destroy segments of the opposing Knight. You can damage their legs to make them slower, reduce their available actions by destroying the head compartment and all other sorts of things. First, each player plans their actions which can be cheaper or more expensive to use from a pool of 3 points. Snap-firing, whilst wildly inaccurate, is very cheap to do at 1 point whereas aiming your attack makes it more likely to hit but costs 3 points, an entire player’s turn. It’s fun to try to anticipate what your opponent can do in the hopes that you can close in on him whilst he’s attempting to shoot you down. There’s other actions such as rotating your ion shield to increase your armour save or even charging your opponent, too. However, shooting and actually hitting your opponent is something different altogether. “Chase me! Chase me!” Bellowed the Litany of Destruction to The Red Might. The way ranged combat works relies on the roll of 2D6, a red and a blue. These determine the accuracy of your ranged weapons with one die representing where the hit landed vertically and the other for horizontally. For instance, if I wanted to fire at the enemy Knight’s right arm I’d roll the 2D6 and gauge whether it hit or miss. In this instance, if it landed the hit vertically but went astray horizontally to the left, I may miss the arm but still hits the chassis. It’s a nifty little system that I quite enjoyed, in honesty. It feels as though the Knight armed with Reaper Chainsword and Gauntlet was at a slight disadvantage with needing to close a great distance before becoming effective. However, it was still enjoyable nonetheless be it something I don’t think I’d play consistently or frequently. The game can be over in around 20 minutes, once a Knight loses six locations on its reference card it is destroyed. At that point the game ends and the mission is consulted to see if the victory conditions were met for either player. The gameplay experience was certainly a fun way to take the two Knights for a spin. However, there were a few things I felt could have made it a little better. The planning phase has players choose their actions before they are revealed in the execute phase. Some tokens or wheels to plot your plans to then reveal to your opponent would have been a nice inclusion. Otherwise, your opponent may not necessarily be telling the truth as to what he planned depending on what you execute. It’s not game-breaking, but would certainly be nice to have. Another thing that would have been nice would be some tokens for the Knights reference sheet. If you pour the damage onto a Knight and hit across numerous locations it can be tough to track. Post-it notes to hand help this, but some small blast tokens or markers to place on the sheet would have been a fine addition, I feel. The reference cards are quite gorgeous. But, again, keeping track of what damage has been inflicted where proves quite cumbersome without a notepad to hand. The only other gripe I have is that the Renegade Knight decal sheet is notably smaller than the loyalist counterpart. It would have been wonderful to get some more nice, crisp Chaos decals across the Renegade Knight. Maybe even enough for if you wish to build both for the powers of Chaos! Alas, I’ll have to use some of the older decals I have to hand. 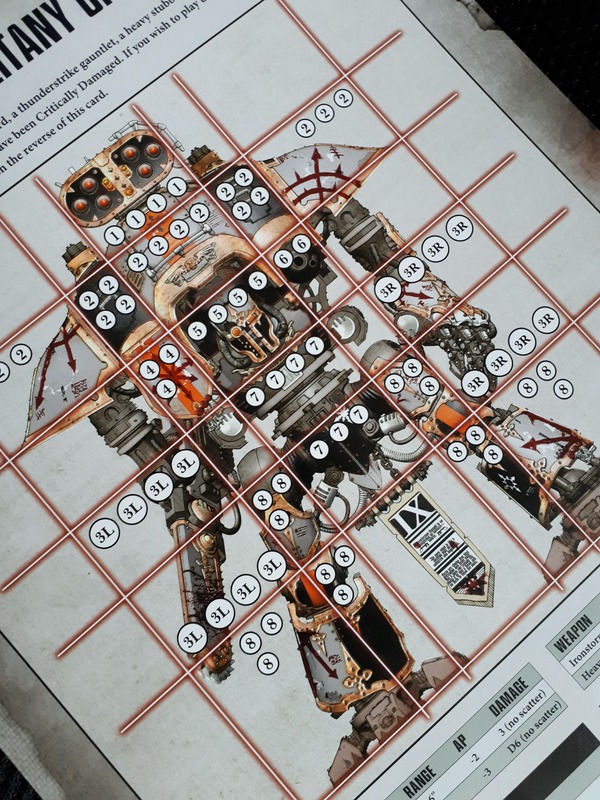 Overall, the Imperial Knights: Renegade boxed game achieves two goals. It comes with a curious game system that you’ll likely play no more than a couple of times. Whilst it’s somewhat enjoyable I find it nothing to write home about. The other goal it provides is the real main course. 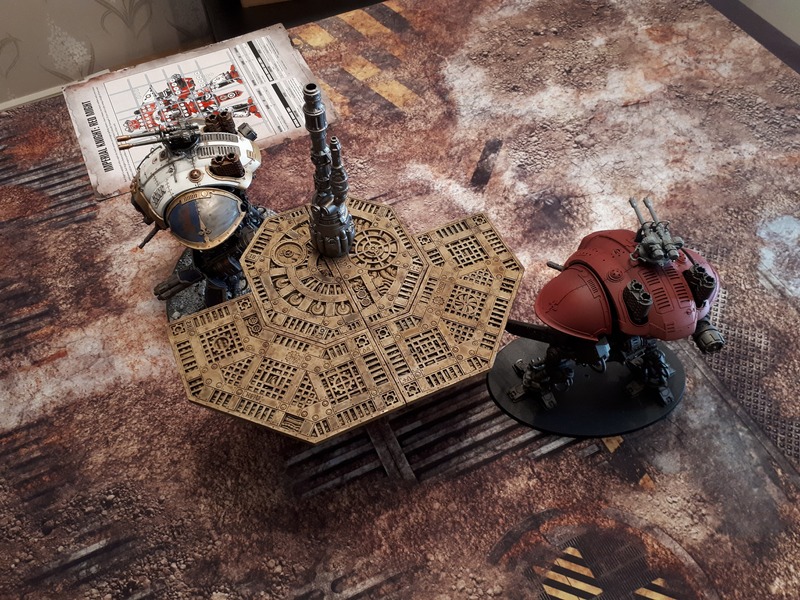 The cost savings are effectively buying an Imperial Knight with some scenery and getting a second Imperial Knight near-free. Unsurprisingly, I presume people buying this box will never try the packaged game within. They’ll be too busy getting their Imperial Knights ready for full battle in Warhammer 40,000. Whilst that may not necessarily be a bad thing, I do wonder what could have been. Generally, I can say I’m happy to jump in on Renegade this time round. My Word Bearers and Death Guard will likely be thankful for the support. As ever, for more on tabletop and wargaming news and reviews, be sure to pop by our Facebook. Blood Bowl Skavenbright Scramblers Dice Sold Out.